We have stumbled onto something rather unexpected, brought to our attention by an ever growing number of our customers. Spike collar defense against coyotes and how our Woofwear spike collars have saved numerous animals lives... and you thought they just looked really cool! If you think coyotes are only a nuisance out west, think again. Once thought to inhabit the western Great Plains, temperate areas of the Rocky Mountains and the Southwestern deserts, the coyote now occupies all of North America. In Orange County California reported stories of dogs & cats snatched off leases or dragged out of their backyards, many only several feet away from their owners, have made these attacks now seem common place. Recently a woman living near San Diego opened her screen door only to have a coyote run inside, grab her cat and run back out. The horrified woman could only watch. A 2009 study in the Journal of Wildlife Management on Coyotes in Tuscon Arizona found 42 percent of their diet consisted of cats. And not just California and Arizona but States from Florida to Washington are reporting coyote problems. Not in my backyard? Ah, think again! Example, Chicago, yes Chicago, has a coyote infestation. The number of problematic coyotes removed annually from the Chicago metropolitan area increased from less than 20 coyotes in the early 1990s to more than 500 coyotes in 2016. 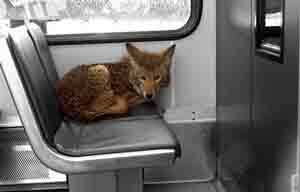 New York City also has a coyote problem. Recently several young girls, ages 3 to 8, in a suburb of the city—Rye, N.Y.—were attacked by coyotes in separate incidences. So what can I do? Well read on Spike-Kwon-Do aficionados! Coyotes and other predators attack by grabbing an animal by the throat and holding on. Not only does this causes suffocation it also lessens the chance of the predator being wounded. Spiked collars have been used for hundred of years to protect working dogs and domesticated pets from wildlife. If an attacking animal gets a mouthful of spike they most likely are going to let go and seek easier prey elsewhere. The leather material will also help minimize puncture wounds. 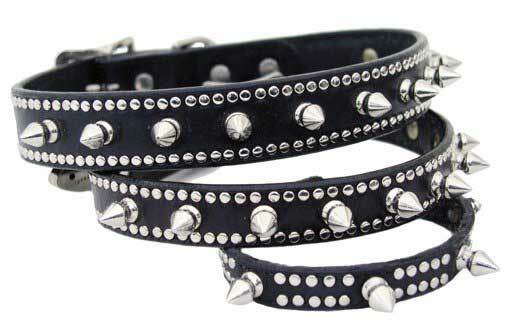 When you think about it, a spiked leather collar will also confuse the attacking animal as when they are holding on to the neck they will not be able to feel a pulse, which may disorientate the attacker thus releasing. (Why is this zombie cat still moving, this is freaking me out dude, I'm out of here)? Customer Testimonial: "The quality of these products is excellent, I purchased a spiked collar several years ago at a retail store and was looking for the same collar for another small dog as protection from coyotes. My older small dog had been attacked by a coyote and I heard the coyote yelp when it went for my dog's neck; it gave me time to get to my dog and when I did, he had saliva around his neck, I believe this collar saved his little life. When I acquired another similar dog, I wanted the same collar for him; I looked on the internet and couldn't find anything like this, at any price, finally I noticed the small stamp on the end of the collar (in the metal cap) ant I could still read the name - Woof wear. I looked up Woof wear and found the exact collar still being made by them (I purchased my first one over 10yrs ago). Woof wear offers a quality product and many choices of color, sizes and styles". Spikes with Crystal for both cat and dogs. And Giant spike collars for those larger breeds. Keep your garbage and refuse locked safely away in a garage and your trash securely sealed. Make sure to always check your surroundings and to be aware of signs of Coyotes. If you see a nuisance predator report it to animal control. Do not leave your animals unattended or allowed to roam freely. When walking your animal always use a strong lead and perhaps carry a wooden walking stick and pepper spray. Be mentally prepared for the possibility of a attack. Do not be taken by surprise without fighting back. 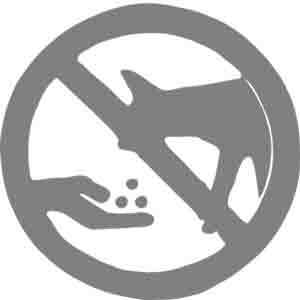 Never ever feed wild animals. This common sense behavior will also limit the natural prey of Coyotes as well as Coyotes off your property. Now you and your pets are on your way to becoming Woofwear "Spike-Kown-Do" Experts! Disclaimer: This blog posts purpose is to inform on what others have reported and to educate on the dangers faced by our pets by predators. We do not warrant our spike collar to stop a coyote or animal attack or that your animal will survive such an attack, however we have many testimonials of how a spiked collar has saved numerous dogs and cats lives. What we can guarantee is that a mouth full of spike is like biting into a steel porcupine and common logic says "that hurts and letting go is the logical option".